RAVENOL OTC Organic Technology Coolant PREMIX -40°C is superior to other glycol based engine coolants. If your looking for an OEM replacement coolant for your vehicle that has the "upper edge" in exceptional performance qualities, look no further. RAVENOL OTC Premix is mixed with 50% deionized water to allow for a -40°C ready to use coolant. RAVENOL OTC Premix coolant also allows for perfect alkalinity of the coolant system. 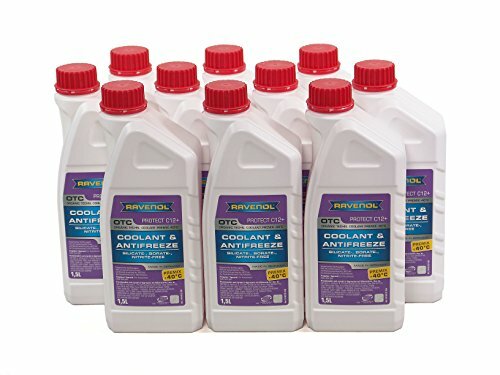 RAVENOL OTC Coolant Antifreeze Premix is a prediluted coolant with frost and rust protection for year-round use in automotive engines. Even in summer coolant must contain enough antifreeze to ensure good corrosion and overheating protection. Undiluted boiling point of 175° C. High flow characteristics without cavitation in high flow, high temperature RPM cooling systems. Contains premium corrosion additives for optimal corrosion prevention for all metals and metal alloys including aluminium in cooling systems providing superior and stable corrosion protection for European alloy engine designs.